Yup. In an attempt to gain a buck or three (which is why any school changes equipment providers), the Wolverines actually lost one of their school colors. I guess the ridiculous jerseys shouldn’t have been a surprise, then… they are, after all, tSUN. Speaking Of Adidas- In case you missed it, Buckeye hoops target Tony Parker signed with UCLA. Interestingly enough, his AAU coach will also be working there, and his AAU team was sponsored by Adidas. Also, UCLA commitment Shabazz Muhammed’s sister has a contract with Adidas, who also sponsored Muhammed’s AAU team. You know where this is going, right- UCLA is an Adidas school. This shouldn’t be a surprise to anyone that’s followed North Carolina and Duke basketball, but if it is, you should check out this book. It’s a bit dated, but it was written as the genesis of a lot of the things that we now take for granted were formed. It’s All Academic, Part One- You know what they say about SEC schools? Yeah… they were right. 1.9 GPA average by scholarship football players? That’s the AVERAGE, and you know some of those young adults were taking classes that were easy A’s. Draw your own conclusion… use crayons if you’re in Knoxville. Party Time With Charlie! As “He Who Will Benefit The KC BBQ Economy” continues to rebuild the hopes and dreams of Jayhawk football, he realized that they don’t know how to have fun. So, what to do? Practice celebrating! You might remember Mark Asper. Big guy. Played very well. Saved a choking man’s life a few days before the Rose Bowl, which generated some fairly positive publicity for his school. Hey Mark, what do you think of the auction? “It’s just like another scheme, another wrinkle where the university, the football program and Nike are gonna make tons of money off me and my buddies,” Asper says. It’s All Academic, Part Two- The NCAA is pushing toward new guidelines, as we mentioned before, but not everyone’s excited about it. There are a number of academicians who are concerned that the higher expectation and standards will not raise the work that the student athletes are doing, but instead will funnel them to easier majors and be susceptible for more academic fraud. 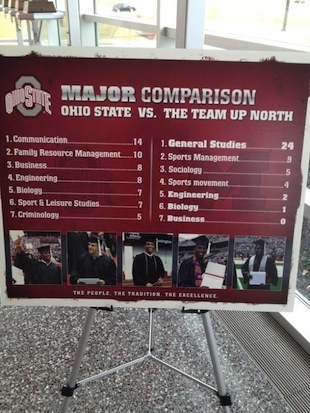 Again, remind me why we keep kidding ourselves about “student” athletes in revenue generating sports? This Week In Douchebaggery- Mormon kid wants to transfer to Mormon school, Coach says no. Good times. Equal Time- Since we shilled for Adidas, here’s a video tour of Nike’s Oregon’s locker room, paid for by Phil Knight. As a reminder, this exists during a time where student fees and tuition are on the rise in Eugene (fees that support athletics), budgets and departments and faculty are being cut, and state tax dollars are being decreased. Enjoy! It’s All Academic, Part Three: Luckily, there’s talk about delaying some of the changes in order to let programs adjust. I’m sure UConn will be glad to hear that. This can only mean one of two things- 1) Things were more broken than the NCAA anticipated or 2) Some of the revenue schools would be in trouble if this moves forward. In Case You Thought We Missed It- John L. Smith is the coach at Arkansas. That is all. That quote was the talking point today at the end of the BCS meetings in Florida, and it seems as if we’ve seen the end of the current morass. Before we get all excited and stuff, though, let’s remember that we’ve been down this road before- this whole thing came from people being dissatisified with the “Bowls and Polls” National Title decisions in the 80′s and before. Then, we matched the top two teams, and everyone got their knickers in a knot about people being “excluded”. So, they came up with another formula, and tweaked, and tweaked it, and tweaked it… and here we are. Short of some sort of “best of seven” tournament with 120 schools, there will always be someone who’s miffed and screaming for more change. And yet, here we are at the beginnings of the next (not better, just different) phase in this process. Here’s the stuff you need to know from the week thus far. The Basics- Here’s a couple of quick overviews of the folks at the meetings as well as some of the things that were initially being considered: Tide Sports, Yahoo! and The Chicago Tribune do a pretty good job at getting you started. Tuesday’s News- ESPN (finally) gets on board with the conversation, and CBS says its looking more and more like a four team “event” that will play into a championship game. The Tuesday “issue” was that the idea of having early rounds on college campuses would not be feasible due to these locations not having the infrastructure necessary to hold events of such magnitude. We’ll get back to that in a second- Frank the Tank talks about how these plans may impact the Rose Bowl tie ins longer term (again, more in a second). Wednesday’s Reality- And now, we start to punch holes in everyone’s arguments. First, the idea that colleges not having the infrastructure to host games on campus is pretty full of crap; SBN looks at the sheer numbers, and points out that the major schools (ie- those that would be involved) have stadiums that are more than big enough to be home venues and are bigger than most of the BCS locales except for Pasadena. In rare moments where there would be a problem, why couldn’t a team defer to a closer NFL stadium- Boise headed to Seattle, Baylor plays in Dallas, Northwestern goes to…. sorry, I just couldn’t do it. EDSBS’ Spencer Hall takes it one step further, and points out that it’s not about “infrastructure” (space and facilities) but “INFRASTRUCTURE” (money and more money). Heck, even these BCS meetings are financial boondoggles. Dan Wetzel attacks the numbers a lot more specifically, and points out that everything at a bowl game is for the profits of the bowl committees… even the halftime performers ($182K for band tickets alone) and the coaches’ families. So this has… big surprise… little to do with “crowning a champion” and everything to do with money- you can’t do these games on campus, because that’s not what helps the folks who are behind the games. And that’s not just the Bowl Committees, it’s also the conferences who are looking for every way they can to help subsidize growing athletic departments in an era of expansive spending and economic instability in higher education. Coming Up Roses- Then there’s this: The Athletic Director at the University of Screw You, We Have Our Own Network is in a tizzy about the PAC and B1G’s being dedicated to preserving some semblance of Rose Bowl tradition, saying that it’s holding up the playoff process (read- “my cash cow”). On this matter, I’m torn- I love the Rose Bowl and am already camping out for the 2014 OSU trip to Pasadena. It is special, and should be treated as such. That being said, I also see DJ’s point at Land Grant Holy-Land; The “Grandaddy Of Them All” stopped being special when they sold out to be a part of the BCS (although I would remind him that the game was a financially motivated endeavor from day one). Need a game north of Kentucky (St. Louis, Chicago, Philadelphia, New York, Minneapolis… where ever. Conference champions only. You don’t like that? Change conferences- otherwise the regular season is worthless. No independents. Make up your mind, Notre Dame – you wanna play Stanford and USC and Navy and Air Force, or do you want to play for the national title? Question- Will this kick start the next round of conference expansion? I certainly hope so.